Please note that the content of this book primarily consists of articles available from Wikipedia or other free sources online. 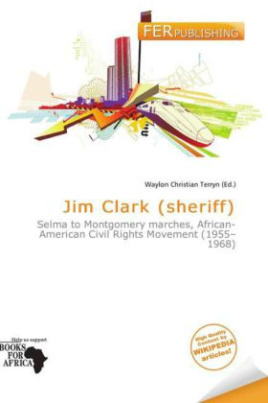 James Gardner Clark, Jr. (September 17, 1922, Elba, Coffee County, Alabama - June 4, 2007) of Selma, Alabama, was the sheriff of Dallas County, Alabama from 1955 to 1966. He was one of the officials responsible for the violent arrests of civil rights protestors during the Selma to Montgomery marches.Clark served with the U.S. Army Air Force in the Aleutian Islands during World War II. He was a cattle rancher when lifelong friend Governor of Alabama Jim Folsom appointed him as sheriff in 1955.